March 21, 2012, 10 a.m. The spring 2012 issue of Nieman Reports asks newsroom veterans to critique their industry — and themselves. By Adrienne LaFrance @adriennelaf March 21, 2012, 10 a.m.
Our colleagues upstairs at Nieman Reports are out with their Spring 2012 issue, and there’s plenty of good stuff in there: Stefanie Friedhoff on the challenges of global health reporting, Steve Weinberg on Chauncey Bailey, notes from a Gay Talese talk, and more. But it’s the cover package that might be of the most interest to Lab readers. 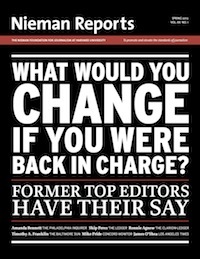 Nieman Reports asked six former newspaper editors a simple question: What would you change if you were back in charge? Without worrying about tradition, how would you best organize the resources of a newsroom to do great journalism, serve your audience, and make the newspaper a sustainable business in 2012? The new issue features essays answering that question from former editors at The Baltimore Sun, the Clarion-Ledger of Jackson, Miss., New Hampshire’s Concord Monitor, The Ledger in Lakeland, Fla., The Los Angeles Times, and The Philadelphia Inquirer. What do they suggest? Distinguish between reverence for the past and reluctance to face the future. Hire more investigative reporters. Accept that there is no magic bullet to save journalism. Ask yourself: Do you really need a print edition on Mondays? Encourage extraordinary work, and give reporters what they need to produce it. Your newspaper can’t be everything. Know the community you serve. Report, don’t just repeat. A business-side problem is everybody’s problem. Good journalism is good business. Keep trying as many things as possible. Here are links to and quick excerpts from the six essays — but be sure to check out the entire issue, which is online now. If I were starting over in the top job at the Sun, knowing what I know now, my new mantra for the newsroom would be: We are a digital news operation with a print component. We are not a print newsroom with a digital component. That is the organizing principle that guides all of our decisions, I would tell my staff. Strong reporting questioning authority, exposing corruption, and speaking for the powerless has led the way for many years in separating newspapers from their competitors. Any newspaper without strong investigative reporting is on the verge of becoming irrelevant. The Monitor has a fine tradition of doing in-depth photo projects, including one that won a Pulitzer Prize. But to fulfill the paper’s daily photo demands while also doing such projects requires a larger staff than the Monitor can now afford. I’d start using photos taken by readers. Everyone now has a camera so amateur photojournalists are everywhere. Skip Perez, former editor of The Ledger in Lakeland, Fla. Eroding faith in a noble calling is a plague on the craft, with far-reaching implications for the future of the profession and, more important, democracy. But my sense is that almost everyone is overlooking the “people piece,” meaning the newsroom staffers who should care deeply about the quality of their work and feel good about it every day…How might newsrooms recapture that essential spirit, short of hiring a managing editor for psychotherapy? I can’t say precisely how I would realign my staff and resources to populate the ranks of the new newsroom. But it wouldn’t be that hard. And I know it would take some new investment to provide the kind of training and education that currently doesn’t exist. Lastly, I would lead a crusade to convince journalists in the newsroom that they can no longer expect someone else to solve their problems. Journalists of my era often responded to the challenges posed by the industry’s shifting business model with the retort: “That’s a business side problem.” More often than not, though, the business side’s answer was budget cuts that diminished journalism. Tomorrow’s newsroom leaders must take responsibility for the success of the enterprise by convincing themselves, readers and owners alike of something that has always been true: Good journalism is good business. We editors are brave at standing up to power or danger or opprobrium — as long as it is coming from the outside. We are surprisingly weak at facing down the stares from within our own newsroom when we hear, “That’s not what we do,” “That’s not my beat,” or “We’ve never done that.” How many more times should I have said “Yes it is,” “It’s your beat now,” “It’s time to try.” I should have been braver at recognizing the difference between a reverence for the past and a reluctance to face the future. POSTED March 21, 2012, 10 a.m.
LaFrance, Adrienne. "New in Nieman Reports: What former top newspaper editors would have done differently." Nieman Journalism Lab. Nieman Foundation for Journalism at Harvard, 21 Mar. 2012. Web. 20 Apr. 2019. LaFrance, Adrienne. "New in Nieman Reports: What former top newspaper editors would have done differently." Nieman Journalism Lab. Last modified March 21, 2012. Accessed April 20, 2019. https://www.niemanlab.org/2012/03/new-in-nieman-reports-what-former-top-newspaper-editors-would-have-done-differently/.